religious leaders held a peace walk in downtown General Santos. youth generation that peace is possible. To achieve world peace, many organizations came together and held a peace walk in General Santos city. Moreover, they held a peace forum and discussed the solution to the conflict of Mindanao and how peace can achieved. Elizabeth Cachin reports from Geneal Santos city. To achieve world peace, the peace advocate Chairman Man Hee Lee of Heavenly Culture, World Peace, and Restoration of Light and Chairwoman of International Women's Peace Group visited the Philippines January 2014. Heavenly Culture, World Peace, and Restoration of Light led the peace walk held in General Santos city. Many youths and religious leaders attended the peace walk. Also, they held a peace forum and discussed how to achieve peace in Mindanao. At this peace forum, there was a historical ceremony for signing the peace agreement between Archbishop Emeritus Fernando Capalla of Davao and Toto Mangudadatu, the governor of Maguindanao. Through this, peace will be achieved in religion. 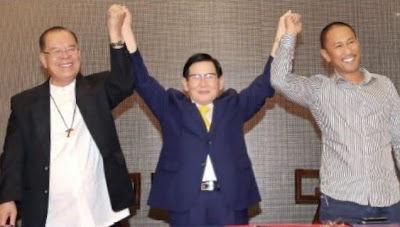 The organization of religious leader Man Hee Lee left Mindanao for Manila and held a world peace forum there as well. The peace advocate Man Hee Lee talked about the peace walk and the ceremony for signing the peace agreement held in General Santos. After the forum, religious leader Man Hee Lee and the delegates of Heavenly Culture, World Peace, and Restoration of Light met Fidel Ramos, the former president of the Philippines, who has made efforts for peace, and they exchanged their opinions. After a productive meeting, Heavenly Culture, World Peace, and Restoration of Light returned to South Korea. It seems that through these wonderful events, efforts for ending war and world peace have become stronger worldwide. This has been Reporter Elizabeth Cachin.